I've seen quite a few pictures of the lunar eclipse and decided to share mine. Robin and I camped out in the front yard with our sleeping bags and our big dog Jake. He didn't seem too interested in the eclipse for some reason. I tried to explain the whole moon earth sun thing to him but the belly rubs were more to his liking. We had a perfect view of the moon, no clouds and a nice dark sky. I set up my camera with my 70-200mm on a tripod, guessed the exposure of 1/500 @f8 ISO 200 which worked out was sheer luck that it was perfect, and let the camera take a picture every 10 minutes. We we laid in the front yard in the sleeping bags and I would wiggle over and repoint my camera every few frames, except when I fell asleep for about an hour and took a few nice pictures of a black sky. I did wake up in time to see the moon turning red but for some reason it wasn't in focus any more. I flipped my camera back to auto focus and tried to let the camera lock on, no luck, I tried manual again but it was as blurry as my vision when I wake up too early in the morning. I finally looked at the front of my lens and realized dew had collected on the front element. Then it took me a few minutes to figure out how to dry it off without trying to wipe it off with a lens cleaning cloth. That would have made it worse. I finally used a rocket blower to blow enough air across the lens to clear it up but I had missed a few frames in the sequence by then. The moon at that point was well below my exposure settings so I adjusted my settings and caught a few more frames. We did wake up Conner during the foggy lens debacle and stuffed him in the sleeping bags with us. He though it was really cool but not enough to stay out of his warm bed longer than 30 minutes so back inside he went. I think the noise the animals around us were making freaked him out a little too. The shot I made is actually 8 shots of the moon and one 8 second exposure of the stars combined together. 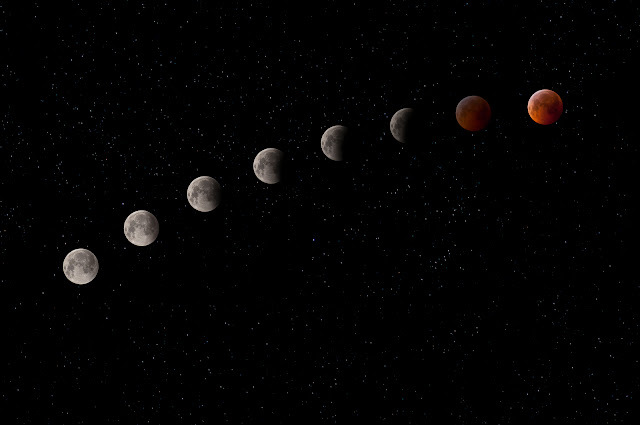 I positioned each image of the moon to my liking and have no idea what the correct path across was. I just liked it this way. Conner said he likes it too and wants it a a poster on his wall. I think I can manage that.